No matter what kind of project you do, you’ve always got scrap wood left over that’s destined for the trash heap. Why waste all that good wood? Save those pieces and use them to make some of these clever smaller projects. Instead of filling up the trash dumpster, you can end up with some clever gifts and useful items for friends and family. Nothing says relaxation like a soak in the tub. Up the indulgence factor by creating a rustic bathtub tray that fits across the tub, ready to hold a glass of wine or cup of tea, along with a handy book for browsing or tablet for Netflix binging. Cut a board that’s six inches wider than your tub and sand it smooth. Nail small wood strips on the underside that fit just inside the tub interior to keep the tray in place. Add kitchen knobs or handles at each end on top to make the tray easier to lift off when you’re done with your bath. If you want to get really elaborate, add angled book rests or drill through the tray to create depressions that hold a cup or glass in place. Finish by staining your tray in an attractive, warm hue that accents the bathroom. Want to know how to add to the fun of a family barbecue? Make giant lawn games that everyone can play! Use some of that leftover scrap wood to create giant dice for playing overgrown dice games on the lawn. Cut 4×4 scraps into 3 ½ inch cubes, sand them and paint or stain them. 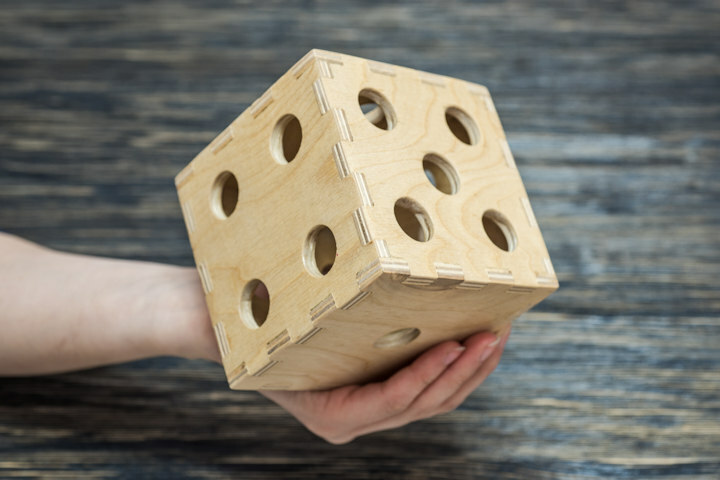 Draw the dots on the dice faces with paint pens, paint brushes, or a wood burning tool. You could also get fancy and use stickers for the dots, adding a coat of varnish to protect the stickers. Everybody’s got that one drawer in the kitchen, the one where everything is a jumble and nothing is easily found. It probably holds batteries (alive and dead), candles, a flashlight, pens or pencils and any number of other items that have no other home. Tame that tangle by using thin strips of wood to create dividers in your junk drawer. Cut slits in each strip that correspond with slits in other strips, creating a crosshatch design. Paint or stain the organizer to match your kitchen. Now let your picky four-year-old have a fun afternoon organizing everything in the drawer. Quiet kid, happy parent. Win-win. Got a hobby like running 5k races or a kid who swims laps like a champ? You probably need more places to display medals and awards around your house. Use leftover crown molding, along with kitchen knobs and hardware, to create a display shelf for your favorite awards. Trophies and race day patches can easily perch on top of the crown molding shelf, while a row of knobs make the perfect place to hand race medals by the dozen. Are you ready for a different look to your holiday decorating? Instead of the same old blanket around the base of your tree, create the look of a rustic fruit crate and fill it with ornaments. Use thin slats of wood to make a 24-inch bottomless box that fits around your tree stand. Paint or stain the box after sanding the wood smooth. Once you’re ready to decorate, set up the tree and stand inside the box, cover the tree stand with burlap, shredded paper or cotton batting, and cover it with colorful ornaments and tiny wrapped boxes. Recycling wood scraps into extra projects is a great way to create a pile of gifts for holidays and birthdays. What’s your favorite use of wood scraps you’ve come up with?